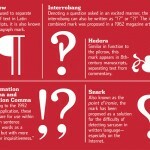 For those of us who care about punctuation (and for those of us who don’t), there’s a super article in the Wall Street Journal called “Is This the Future of Punctuation!?”. You can find it here: http://online.wsj.com/article/SB10001424052970204618704576641182784805212.html?mod=djemWMP_h The author, Henry Hitchings, writes a wonderful and funny piece about how we butcher punctuation in English. 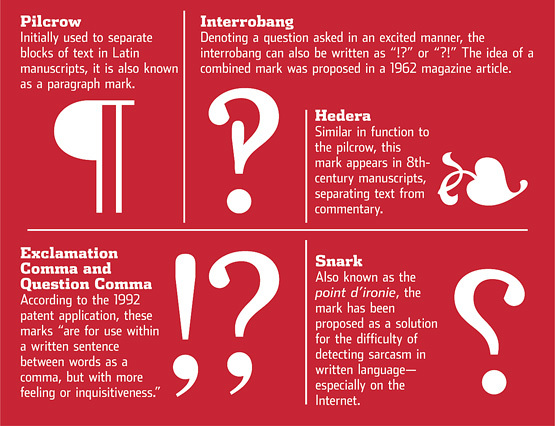 The items we take for granted (or don’t), such as the comma, the exclamation point and the question mark are relatively recent additions. The apostrophe, the author states, is probably on its way out along with the hyphen (except where it will live on in emoticons). I’d be sad to see the apostrophe bite the dust. I’m one of those people who goes crazy when I see punctuation used wrong. But then, linguists are like that, aren’t they? This author’s newest book, The Language Wars: A History of Proper English, will either be a page turner for people who like punctuation or a sleeping pill for people who don’t. I’m planning on being up all night reading.